In this video, I'll show you how to crochet a simple market bag. 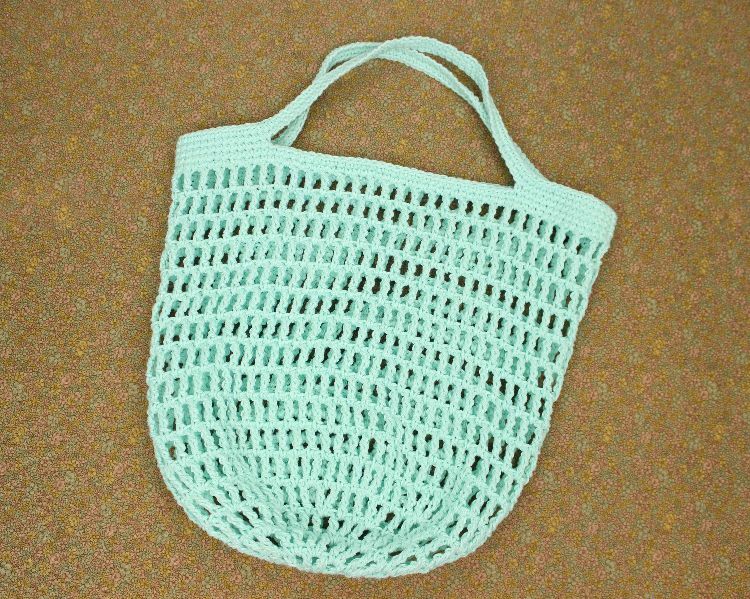 These bags are so useful for the farmers market or even for a trip to the beach! These market bags are very easy to make and don't use much yarn so not only are they fun to make, but also an affordable project! Worsted weight yarn. You'll need around 210 yards. 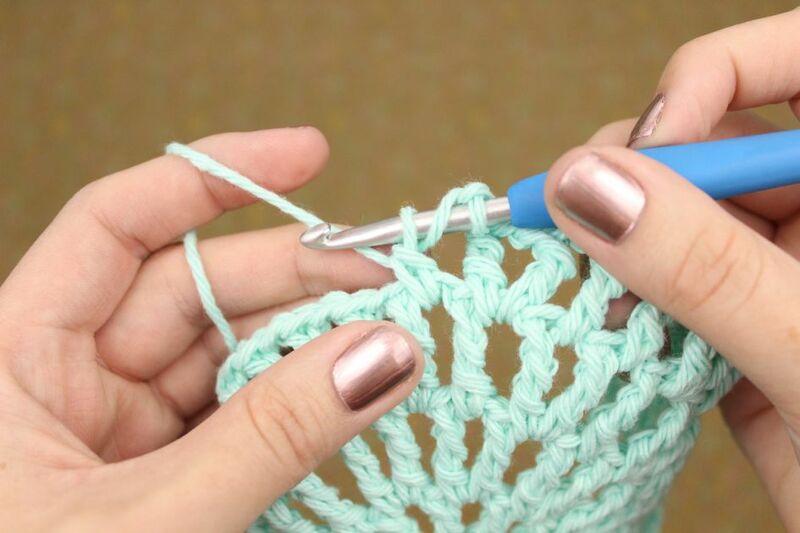 Pro tip: Cotton yarn is great for this project because it's very sturdy and easy to wash! Pro tip: You can easily change the length of the handles by chaining a different amount in round 19 where I chain 50. Round 1: Make a magic ring, ch 5 (counts as 1 tr + 1 ch), *1 tr in ring, ch 1; repeat from * 10 times, sl st to 4th ch to join – 12 tr + 12 ch 1 spaces. Round 2: Sl st into 1st ch space, ch 5 (counts as 1 tr + 1 ch), 1 tr in same ch space, ch 1, *1 tr in next ch space, ch 1, 1 tr in same ch space, ch 1; repeat from * around, sl st to 4th ch to join – 24 tr + 24 ch 1 spaces. Round 3: Sl st into 1st ch space, ch 5 (counts as 1 tr + 1 ch), 1 tr in next ch space, ch 1, 1 tr in same ch space, ch 1, *[1 tr in next ch space, ch 1] twice, 1 tr in same ch space, ch 1; repeat from * around, sl st to 4th ch to join – 36 tr + 36 ch 1 spaces. Round 4: Sl st into 1st ch space, ch 5 (counts as 1 tr + 1 ch), [1 tr in next ch space, ch 1] twice, 1 tr in same ch space, ch 1, *[1 tr in next ch space, ch 1] three times, 1 tr in same ch space, ch 1; repeat from * around, sl st to 4th ch to join – 48 tr + 48 ch 1 spaces. Round 5: Sl st into 1st ch space, ch 5 (counts as 1 tr + 1 ch), [1 tr in next ch space, ch 1] three times, 1 tr in same ch space, ch 1, *[1 tr in next ch space, ch 1] four times, 1 tr in same ch space, ch 1; repeat from * around, sl st to 4th ch to join – 60 tr + 60 ch 1 spaces. Round 6-16: Sl st into 1st ch space, ch 5 (counts as 1 tr + 1 ch), *1 tr in next ch space, ch 1; repeat from * around, sl st to 4th ch to join – 60 tr + 60 ch 1 spaces. Round 17: Ch 1 (counts as 1 sc), 1 sc in next ch space, *1 sc in next st, 1 sc in next ch space; repeat from * around, sl st to ch 1 to join – 120 sc. Round 18: Ch 1 (counts as 1 sc), 1 sc in each st around, sl st to ch 1 to join – 120 sc. Round 19: Ch 1 (counts as 1 sc), 1 sc in each of the next 14 sts, ch 50, skip 31 sts, 1 sc in each of the next 29 sts, ch 50, skip 31 sts, 1 sc in each of the next 14 sts, sl st to ch 1 to join – 58 sc + 100 chs. Round 20: Ch 1 (counts as 1 sc), 1 sc in each of the next 14 sts, 1 sc in each of the next 50 chs, 1 sc in each of the next 29 sts, 1 sc in each of the next 50 chs, 1 sc in each of the next 14 sts, sl st to ch 1 to join – 158 sc. Round 21: Ch 1 (counts as 1 sc), 1 sc in each st around, invisible join to ch 1 and fasten off. – 158 sc.